Head Down, No-Nonsense Rocking Rolling Boogie Blues. I liked JJ Nichol’s recent debut album a whole lot more than I thought I would; as it was very reminiscent of the British Blues Rock I grew up on in the 1970’s. To coincide with his UK Tour supporting Deep Purple legend Glenn Hughes the handsome young guitarist is releasing a 5 track EP in a similar vein. The opening track will excite a lot of guys my age; but left me a bit bewildered as I’d airbrushed Grand Funk Railroad from my memory banks many years ago. In fairness Nichol’s treatment of We’re An American Band is more in keeping with Bad Company or Stone the Crows than the original purveryors of plodding Pomp Rock; and I’ve quickly grown to like the song. Next out of the traps is Humble Pie’s boogielicious 30 Says in the Hole. You have no idea how close I was to standing hands on hips and shaking my near balding head for all it was worth as I was transported back to the Sunday night disco at Stanley Youth Centre. The final two tracks are also Nichols originals from Old Glory and both would have won heaps of fans if they’d been played on OGWT in those halcyon days. 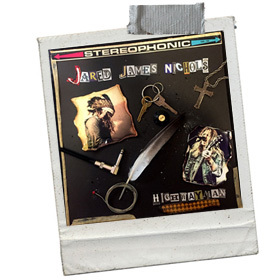 I know it’s because I’m ‘a man of a certain age’ that I keep harking back to the olden golden days of Blues Rock; but just about everyone else I hear play Rock guitar under the age of 30 seems to go off on long tedious meandering Jazz-Fusion solos; whereas Jared James Nichols just might be the last flag bearer of the Rock SONG!